It may not feel like spring but it's time to think about your garden. 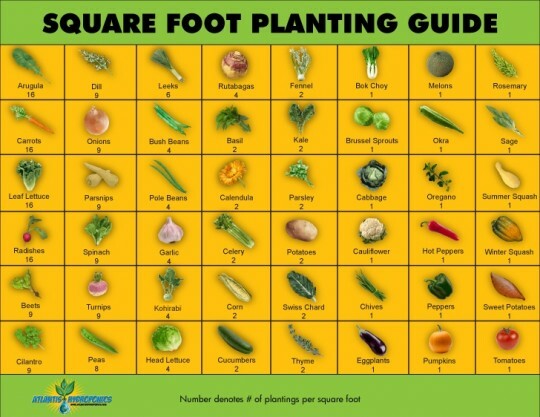 If you've thought of trying square foot gardening because of its efficiency you'll want to print out this helpful planting guide from Atlantishydroponics.com. If you're new to square foot gardening it can be difficult to know how many plants can go in each square foot space. If plants are planted to closely together they won't get the nutrients the need and the sun will eventually be blocked out by other plants. This Square Foot Planting Guide, provides the right number of plantings you can have per square foot. This is helpful so that as you are planting your next garden outside or in a grow tent, you can plan ahead. The infographic includes vegetables that vary from arugula to hot peppers and spinach.